LOS ANGELES — Washington defensive coordinator Jimmy Lake’s defense will give Ohio State its second-straight bend-but-don’t-break defense it has seen in the past two games. The Huskies like to keep the ball in front of them, allowing 8.93 passing yards per pass attempt, the lowest in college football. 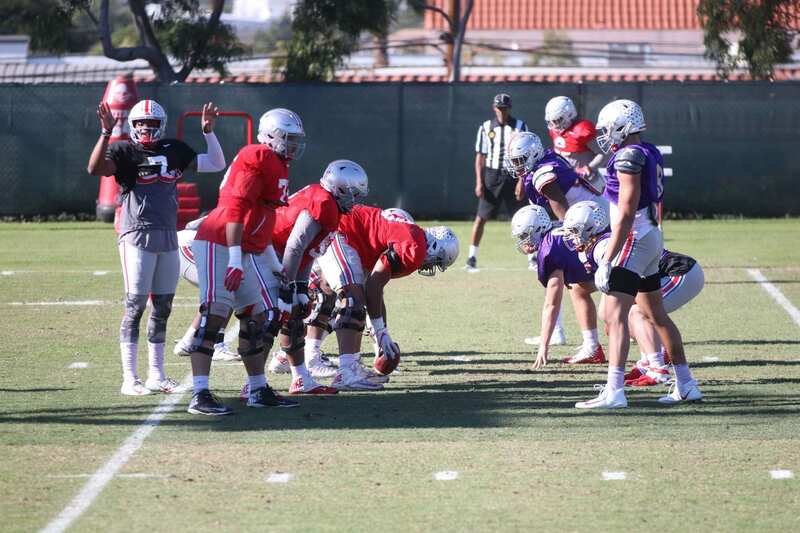 But Lake said he knows what he is in for when facing Ohio State redshirt sophomore quarterback Dwayne Haskins: an athletic, big body with a strong arm that can make throws, coordinating the offense from the line of scrimmage. The defensive coordinator called Haskins the best quarterback the Huskies will face all season. But Washington has had a challenge like this before. It faced the No. 1 pass offense in college football in Washington State, using its zone defense approach to limit redshirt senior quarterback Gardner Minshew to 152 yards passing with an interception despite completing 74.3 percent of his passes. Lake feels his secondary has the opportunity to prove something similar to what the Huskies did against Washington State in the Rose Bowl. On the other hand, Haskins put up some of his best numbers against one of the statistically best defenses in the country. Although different in scheme, Michigan held the top scoring defense in the country before the redshirt sophomore quarterback lit the defense up for 396 yards and six passing touchdowns. Facing a Northwestern offense with a similar zone defense to what Washington prides itself in, Haskins thrived as well, throwing a career-high 499 yards and completing 82.9 percent of his passes. Haskins knows what to expect from the Washington defense. He said the Huskies have more of an NFL-based defense, playing a loose zone with a man coverage element to cut the use of mesh routes the Ohio State offense loves to utilize. Haskins said Washington brings a defense with a Northwestern-type scheme with Michigan-level talent, something Huskies sophomore cornerback Byron Murphy is confident Ohio State has not seen before this season. This kind of defense is what the Ohio State wide receivers are expecting to see in coverage on Tuesday and are preparing for in practice. Washington knows that if a ball gets behind a defensive back playing in the zone defense the Huskies utilize, it’s a play likely for big yardage, possibly a score. The Huskies will strive to keep the ball in front of their cornerbacks and safeties, limiting Ohio State to high-percentage, but short-yardage completions. To Lake, this kind of matchup is what bowl season is for.